Owing to extensive woodworm damage, part of the rail had collapsed and been inadequately repaired by tacking on a piece of soft-wood. A piece of thick canvas had then been glued over the rail to 'reinforce' it. The canvas had not adhered well and had been of no benefit other than obscuring the poor quality work behind it. 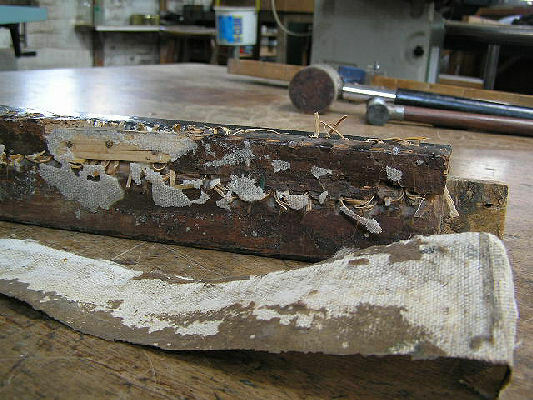 Worm-eaten wood was machined away on all four side rails. This provided a sound base for fixing on new wood, using scotch glue only. The new wood was then drilled for the new cane, then re-coloured to match the existing finish. The quality of this repair is self-evident and should be long lasting. HFW, March 2006.